Home about Election Who is Raju Bista, BJP’s Darjeeling constituency nominee? 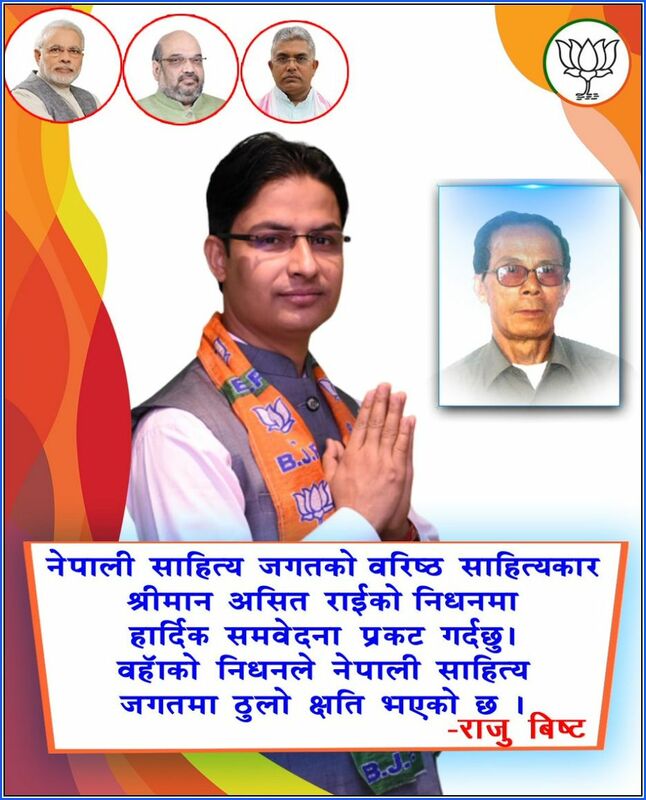 Who is Raju Bista, BJP’s Darjeeling constituency nominee? When BJP had fielded 33-year-old Delhi-based entrepreneur Raju Bista from West Bengal’s Darjeeling constituency, it took many by surprise. Bista, who traces his roots to Manipur, is the managing director of a leading Indian multinational group, Surya Roshni Limited. Party insiders say Bista, who has always harboured a passion for social work, got the ticket because he was backed by the RSS. Bista joined RSS in the late 90’s and has had close terms with the with the ultra right-wing outfit since then. Born and brought up in Manipur’s Kangpokh district, young entrepreneur Bista is an ‘unlikely’ candidate of the saffron party. His opponents have called this political greenhorn an ‘outsider’ to Gorkha dominated Darjeeling. In response to which, Bista said that he was “the son of a Gorkha” and he would never betray them. “I will assure that no Gorkha will have to lower his head because of me,” he said. BJP national general secretary Kailash Vijayvargiya says it is Bista’s “extensive background in social work” that prompted the party to choose him. Much before he became an MD of the electrical giant, Bista joined an NGO and was proactively involved in various development projects in Darjeeling. From founding clubs in Darjeeling (Bharat Youth Club) to promote sports amongst the youths of the hill station to organizing personality development events for school children to giving grants to Sanskrit schools, Bista has made innumerable contributions for the uplift of the people in the area. One can tell from Bista’s work that he is naturally inclined to the Sangh Parivar beliefs and has a nationalist mindset, providing grants for various schools run by the RSS as well as economically helping Sanskrit schools in Manipur. Also, a keen believer in Narendra Modi’s ‘Adarsh Gram Yojna’, Bista has aided for the uplift of several tribal villages in Chattisgarh. Bista, although is closely associated with Darjeeling on a personal level, his candidature by BJP, who enjoys support and alliance from Darjeeling’s two most powerful groups – Gorkha Janmukti Morcha (GJM) and Gorkha National Liberation Front (GNLF), has created dissent amongst the Gorkha population of the district. GJM and GNLF are the two influential local outfits that have carried out stern and violent movements demanding a separate Gorkhaland. “We have to work for the people in the hills as well as those who live in Siliguri,” maintained Bista who is facing Trinamool Congress candidate Amar Singh Rai, a veteran of GJM, and also the sitting MLA from Darjeeling for the seat. Darjeeling constituency comprises the hill towns of Darjeeling, Kurseong and Kalimpong as well as the plains of Siliguri.